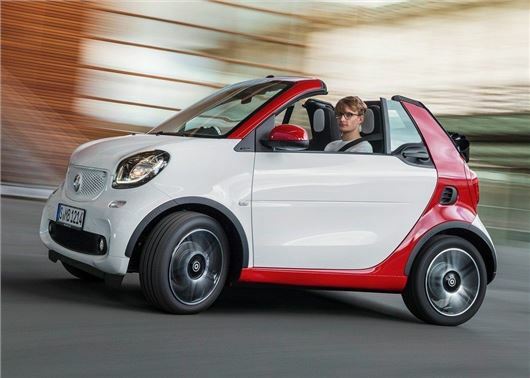 Smart has confirmed the pricing of its new Fortwo Cabrio. The soft-top city car will be priced from £13,265 when it reaches the UK in early 2016 and will feature an electric fabric roof that can be lowered or raised at any speed in 12 seconds. The Smart Fortwo Cabrio is offered with the same three-cylinder petrol engines as the hard-top version, with the entry-level powertrain being the non-turbocharged 1.0-litre petrol with 71PS and matched to a five speed manual gearbox. A turbocharged 0.9-litre unit will also be available with 90PS and the same five-speed transmission, although a twinamic six-speed dual clutch automatic will be available for an additional £995. The 0.9-litre engine is the most economical, returning an official 67.3mpg and emitting a tax busting 99g/km of CO2, while the 1.0 unit - which also emits sub-100g/km - will return a claimed 65.7mpg. Torsional strength has been improved by around 15 per cent to make up for the lack of a hard roof and the Fortwo remains the same size as the standard model, stretching 2.6 metres in length and 1.8 metres in width. Smart says the 260-litre boot will not be affected by the folding roof, although a set of removable roof rails will take up some valuable space. The fabric roof has a total thickness of 20mm to help cut out road noise and the rear glass windscreen will be heated to make it suitable for the winter months. The Fortwo Cabrio will be available in three trim levels - Passion, Prime and Proxy - and base models will feature 15-inch alloy wheels, automatic climate control, Bluetooth and a choice of orange/black or a grey/black interior. Prime models will add heated leather seats and additional instrument pods - clock and rev counter - while the range-topping Proxy trim will feature 16-inch Y-spoke alloy wheels in black, a sports steering wheel and lowered sports suspension. All Smarts will be offered with a range of optional upgrade packs, which will add navigation, LED lights, rear-view camera and ambient lighting.